I have to admit that I kind of come to each Narrows record expecting to hear Botch. This is unfair. The only direct connection between the two acts is Dave Verellen, and while the vocalist does a lot to give a band its own peculiar feel, it is really the guitar (at least in most cases) that is decisive in terms of the sonic topography produced. In terms of heaviness and dissonant elements, Narrows guitarists Jodie Cox and Ryan Frederiksen play in a style that does bear some similarities to that of Dave Knudson. That the careful listener will never mistake the former for the latter should not be taken as a criticism. Listening to Botch, especially their live shows, had a vertigo inducing quality. 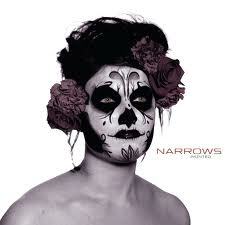 Narrows can write some complex tunes, but they are the kind of band that it’s easier to bob your head to. The first thing you’re going to notice about this record is that it’s a lot more straightforward in terms of tempos than previous Narrows releases. Narrows are sometimes classified as “math rock” or “math core.” One could debate the justice of those designations, but in any case this current release is likely to cost them their union cards in United Math Rockers Local 3.14159265 (if indeed they ever had them). All of which is not to say that the time changes and dissonance that characterized their previous releases have been completely abjured. On Painted, they have been harnessed to an attack that relies on pounding and bludgeoning the listener, rather than leaving them wondering what time signature it was all in. Fans of previous releases, and of Botch, will be pleased to note that one thing that hasn’t changed is Dave Verellen’s gut-wrenching vocal style. As on previous releases, he sounds like he is slicing chunks off of his soul with a butcher knife, his fearsome roaring lending an urgency to the proceedings which manages to retain some of the unsettling qualities of earlier Narrows discs. “Under the Guillotine” opens the action with hammering riff that wouldn’t have been out of place on a High on Fire record. This sets the tone. While their music is often challenging in terms of presenting the listener with square progressions or comfortable melodies, their bread and butter is an uncompromising wall of sound. “Absolute Betrayer” reinforces this point with a series of jackhammer riffs over which dissonant notes float like a halo. “Greenland” starts off with three minutes of weird noise that sounds like it was recorded off Pinhead’s home stereo before mutating into a bombastic, slow burn. From there, matters return to the familiar, punishing furrow that had been plowed through the earlier parts of the disc. There is a lot to like about this record, and its very existence is impressive given that the members don’t get to spend a lot of time together. What is also impressive is that they keep managing to come up with material that is fresh and compelling. If Painted is more straightforward than earlier Narrows releases, it is also the case that they have managed to harness what at times seemed like an anarchic fury into a focused aggression that demands repeated spins. This entry was posted on May 27, 2012 at 3:50 am and is filed under Reviews with tags Botch, Narrows, These Arms are Snakes. You can follow any responses to this entry through the RSS 2.0 feed. You can leave a response, or trackback from your own site.